Alex J. Cavanaugh: Movies Based on YA Books, TV Trivia, Space Opera, Ninja News, and More! Movies Based on YA Books, TV Trivia, Space Opera, Ninja News, and More! Today I’m making an appearance at the blog of Kim Van Sickler! find out why the Space Opera genre isn't just for science fiction fans. To entertain you here with movies and books is Nutschell from The Writing Nut! I’m looking forward to seeing tons of awesome new movies this year. Most of them are Sci-Fi/Fantasy movies and I’ll run out of space if I list all of them. So I thought I narrow down it down to movies based on YA (Young Adult) books, which I’m looking forward to watching. Divergent is the first book in Veronica Roth’s best-selling trilogy. The books are all about a dystopian Chicago, where teenagers are forced to make a choice between five factions: Abnegation, Amity, Candor, Dauntless and Erudite. Each faction is meant to play a particular role in society based on their most distinguishing virtue. On her Choosing Day, 16 year-old Beatrice Prior chooses another faction over her family’s and discovers a dark truth behind their seemingly perfect society. 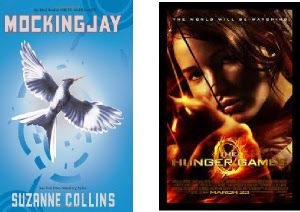 Mockingjay is the final book in Suzanne Collins’s Hunger Games Trilogy. As with all big hits, the final book was broken into two parts. In this first installment, we’ll see how Katniss and the rebels begin the war against President Snow and the rest of the Capitol. Bases on Lois Lowry’s classic novel, “The Giver” tells of a future society that appears perfect—until the twelve year old protagonist Jonas uncovers its dark side. 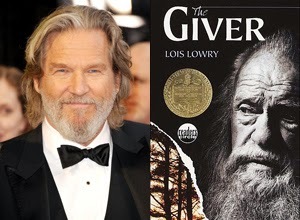 Jeff Bridges is set to play the Giver in this film adaptation. The Maze Runner is the first book in James Dashner’s dystopian series. In this story, 12 year-old Thomas wakes up with no knowledge of his past. He finds himself in the Glades, an encampment at the center of a strange and frightening maze. Surrounded by other boys with memories of their previous lives, Thomas learns to survive, and soon finds out what lies beyond the walls of the maze. Shailene Woodley, who plays the lead in the YA blockbuster movie Divergent, also stars in this film adaptation based on John Green’s best-selling novel, The Fault in Our Stars. In this story, Hazel, a sixteen year-old with terminal cancer, falls in love with Augustus, a former basketball player whose right leg had to be amputated due to bone cancer. The two meet in a support group and quickly begin a relationship that is both heart-warming and heart-wrenching. If you’re a fan of Young Adult books (or good stories, in general), add these movies to your “must-watch list.” You’ll be sure to enjoy all of them! Super thanks for having me on your blog, Alex! 19 authors – 10 writing exercises – 38 combined anthology entries! Today at the Insecure Writer’s Support Group we are featuring are very first guest, the super-talented and awesome Elizabeth S. Craig! She’s sharing the best practices for self-publishers – you don’t want to miss it. Catherina Constantine revealed the cover for her upcoming book, Tallas. Available now – visit their sites for a giveaway! Don’t forget the Online Marketing Symposium is on January 20! Sign up and let us know what has worked (or didn’t) with your online promotions. Open to everyone, not just authors. Hosted by Arlee Bird, Yolanda Renee, Jeremy Hawkins, and Alex J. Cavanaugh. Although some of your answers were awesome! 1 -On The X-Files, what's Mulder's nickname? 2 -What show starred Michael Landon as an angel? 3 -On The Simpsons, who shot Mr. Burns? 4 -What was the name of the charter boat that shipwrecked in the 1960s show "Gilligan's Island"? 5 -What 80s show is Frasier a spinoff of? What movie based off of a young adult novel are you looking forward to? Have you picked up Story Sprouts? Excited about the new books? Signed up for the Online Marketing Symposium? Get any of the cat trivia correct? And do you know any of the TV trivia…? Don’t forget to visit Kim Van Sickler! The film industry certainly seems to be hitting the Ya books at the moment, they all look interesting! I know its not fantasy or sci-fi, but you've gotta give a mention to Warhorse!!! I'm really looking forward to all these movies Nutshell recommended, though I'll probably have to rent some of them. I'll try to stop at Kim's blog too. Few years ago I read The Book Thief and while on hols, we watched the movie. It was really good, but the book was better. I'd still highly recommend it. Loved this list, I'm loving the Suzanne Collins series, and want to see the movie based on The Giver. I only got Cheers and The Minnow. Anyway...I have signed up for the Online Marketing Symposium. I didn't realize that there were so many book adaptations about to release! I enjoyed Divergent and my son loved Maze Runner. Cats can drink salt water? Wow! I have a feeling I'll be dragged along to see a couple of those films. Please tell me they're right, it doesn't happen often!! 1 -On The X-Files, what's Mulder's nickname? Spooky. 2 -What show starred Michael Landon as an angel? Stairway to Heaven. 3 -On The Simpsons, who shot Mr. Burns? Maggie. 5 -What 80s show is Frasier a spinoff of? Cheers. I'm looking forward to seeing The Giver. Love the cat trivia. Always great info, off to check out the symposium! I'll certainly watch out for 'The Giver'; I like Jeff Bridges. (The memory is playing me up at the moment)! I'm off to take a look at Kim's site now. 2) Crap... I used to watch the show. And the cat things... I want a liver that does that. Totally not fair. And finally, good stuff today. Glad to see you posting on Wednesdays again. Shah, I try to post something for everyone! Julie, you got three right. Cindy, that's two, and glad you are with us. Annalisa, you got two right. Fran, you got three, and so close on the fourth. Honestly, I wasn't impressed with the first Hunger Games movie. I didn't read the books. I might though. I'm on book 5 of the Percy Jackson series. I read each night to the boy. The movies don't hold a candle to the books. 1. Spooky, although in one episode a Native American man said he should have been called Sneaky Fox. I cannot WAIT to watch Mockingjay Part 1. Catching Fire was amazing. I actually know a couple answers to your trivia questions! Wow! Now that even Nutschell is recommending Divergent, I guess I'll have to give it read/look. Already picked up a copy of Story Sprouts. Now to get to it! So many good books being made into movies! It makes me so happy. I'm also excited about Ben Affleck starring in the movie of Gillian Flynn's Gone Girl. Hey, Here is an Alert! Thanks Alex for the Ninja News! Hey again thank you very much for the Cat Trivia Answers. Good to roam around. Have Happy Watching and Reading! Heather, I wasn't impressed either. And perfect score on the trivia. I just saw the Divergent trailer last night and am SO excited to see it. Loved that book. Also excited about Maze Runner. I didn't know they were making a movie of it until just now. The Hunger Game movies are also awesome and can't wait to take my son to Mockingjay 1 and 2. We saw Catching Fire on Christmas. I'm going to be a fly on the wall at the symposium as I want to learn what I can. Going to check out the IWSG interview, as well. Yay. I LOVE Cathrina's cover, so awesome! For the trivia - 1. Spooky, 2. Highway to Heaven, 5. Cheers. Can't remember the other two! I knew most of the cat trivia. Can't wait to see so many of the films from books, Nutshell. Okay, The Giver.... I'll definitely have to see that one. For some reason, I've never read the story. My reading-hater daughter was forced to read it during her 8th grade year as a class assignment. To my shock, she actually read it. She still talks about it today. Guess I'll have to read it, too. For the TV Trivia, the answer to #1 is Spooky. Man, I miss The X-Files. And I'm looking forward to quite a few of those YA movies coming out. I'm torn about seeing The Fault in Our Stars - the books was so sad, not sure I can handle the movie. 31mph??? How fast can mice run? Lots of great movies coming out. I'm waiting to see Vampire Academy. Aside from YA, I just saw the commercial for The Lego Movie yesterday. Hilarious! Sheri, that's funny your daughter doesn't like to read. Maurice, that's cool she blogs. Sean, apparently not fast enough! Frasier is a spin-off of Cheers. And I feel like I should know who shot Mr. Burns, but I can't remember! Always enjoy Y/A books, not so much the movies. I rarely watch a movie if I have read the book. I often read the book of a movie I have seen though. However I see on my Kindle I have over 500 books to be read. Don't know the trivia, but I was interested in the cats answers. Yes, "The Giver" is what attracts me. Jeff Bridges is an actor who has always liked! Geez, if only I wrote YA...the Hollywood market seems to be booming!! Leovi, I've always liked Jeff Bridges. I'm looking forward to Vampire Academy by Richelle Mead - the movie is being called Blood Sisters and comes out next month! Oy, don't know any of the TV trivia, Alex. Wait, was Frasier as offshoot of Cheers???? I know the answers to trivia, sad... i think not. let's call it special. Hoping over to your visit, great post for today... by the way! trivia for you: who is taller John Wayne or John Belushi? I'm looking forward to The Giver and Divergent too. I don't know if I can see The Fault in Our Stars because I'll cry the whole time. Great list, though I don't intend to see them in the theater. It's just too expensive. Interesting trivia as I live with 2 cats. I'm a bit worried about The Giver. One of my favorite childhood books, and they've signed on Taylor Swift. WE'll see, but I sure hope they don't ruin it in some way or other. Apparently I knew absolutely nothing about cats. Thank you Alex for promoting my Book Cover!! Looking forward to some good movies!! Highway to Heaven is the show Landon played an angel, easy one I watched it all the time. Another easy one is Frasier is a spinoff of Cheers. I should know Mulder's nickname cause we never missed a show, senior moment I guess! I bet my daughter is looking forward to The Fault In Our Stars. She loved that book. Cheers to Nutshell on her book, too! Melissa, now you know them a little better. Cathrina, you're welcome. And you got two right. They seem to be hitting the ya books a ton in hollywood, beats remakes any day. I wonder if it's because dogs are more work and cats, well, not so much. I haven't heard of The Giver, but I like Jeff Bridges and the premise intrigues me. Nutschell is a fun lady. Thank you so much Alex for promoting our book cover!! I'm excited about a lot of the book to movies that are coming out! I'm so excited for all the book adaptations! Though, I don't think I can see FioS without bringing a big box of Kleenex. Ha, I never know the answers to your trivia questions but I do know that Michael Landon was in Highway To Heaven, because my mum used to watch it lol! I might've written YA, but I've never been crazy about YA movies. As paw usual, a wealth of info on your site. Pawesome answers to the cat trivia. I must come over to North America and find out why humans there would prefer a cat of a dog. Good grief! I know the X-Files was filmed in Vancouver, along with just about every other American show. Pat, perfect score this week. Ivy, or not at all! Suze, three and a half. Kyra, then you knew one - awesome! Penny, you need to set them straight. And you do know your Gilligan's Island. 4. S.S. Minnow, I think. Alex!!! Thanks so much for having me on your awesome website! That book cover by Catherine is intriguing! I'll have to check it out. ooh I heard about the ONline Marketing Symposium from Arlee. I'll have to go check that one out too. And those cat trivia answers--wow. I never knew bezoar was an actual word. Always thought JK Rowling made that one up for Harry Potter. And I always thought dogs were more popular than cats here in the US. Anyway, just excited to be sharing your space today!Thanks again! Also, that's a ton of dystopian YA tales being made into movies. I guess the teens these days are really crazy about the desolate end of the world, eh? I'm always a bit leery of adaptations. Especially of books I particularly loved. I'm always cringing the whole time, hoping they don't kill it. I enjoyed the first 2 HUNGER GAMES Books, but MOCKINGJAY left a bad taste in my mental mouth. I hear that the 3rd book in the DIVERGENT Trilogy does the same. I don't think I'll see the MOCKINGJAY films nor DIVERGENT for that reason. Best of luck to all the authors releasing books now!! Ray, didn’t Warhorse come out in 2011? Or was that a different movie? At any rate, I still have to watch it. I heard it was good. Shah, I’ve read the Book Thief and it’s beautiful. I have yet to watch the movie though. Julie, thanks! Jealous you answered most of the trivia questions. I only knew 1! Cindy, great to meet you! Annalisa, if you have any teens or YA loving friends, you probably will be dragged into the theater. Tracy Jo, me too! I love cats, so any trivia about them is fun to learn about. Fanny, I like Jeff Bridges, too! I think he’ll make The Giver an outstanding film. Rusty Carl, I want a liver like that too. I’ll never go thirsty with an ocean nearby. Heather, books are always better than the movies! Though I surprised myself after watching Catching Fire. I actually felt like the movie was better than the book. Or maybe I just have to re-read it. Optimistic Existenalist, Me too! Excited to see Mockingjay. Kim, I’ve been hearing about Gone Girl a lot! Must check that out. Brian, check story sprouts out! Lots of good writing exercises in it. 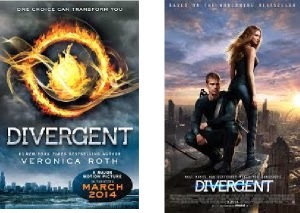  I think you might enjoy Divergent. Shell Flower, the Maze Runner movie was a surprise to me too. A good one though!Super excited for Divergent. Julie, I agree. That book cover is amazing! Teresa, I didn’t know any of the cat trivia so I was well surprised by them. Can’t wait to see the films too! Maurice, it does sound like 2014 is the year of the YA. I knew Veronica had a blog but I’m not sure if she posts there regularly. Will have to go check it out. Cherie, love the cat trivia too. And I’m amazed that you answered all the trivia questions! And, yet, when you ask people which they like better, more people say dogs. I wonder if it's because so many apartment complexes don't allow dogs but do allow cats. Sean, that’s a great question! How fast do mice run? L.G. they are outstanding novels and I’m sure they’ll be great films as well. Christine, I wanted to put Vampire Academy on the list, too! But I realized I only needed 5. Rachel, crossing my fingers they don’t mess up the Giver as well. Jo, I have more than 500 books on my kindle waiting to be read. And I am dying to read them all! Leovi, Jeff Bridges is a good actor. Love watching his films. SC Author, so many more movies I haven’t listed here! And I still have movies from last year that I’ve yet to watch. Liz, YA is probably the most popular kid lit genre. Juliana, saw the trailer for Vampire Academy and thought it would be a fun film. Karen, I don’t know any of the trivia either! Melissa, I like watching sci-fi/fantasy movies on the big screen because I get to enjoy the special effects, and I wait for the other genres to come out on DVD. SL Hennessy, I heard about Taylor Swift coming on board. I hope she makes the movie better, not worse. Patsy, me neither! And I have two at home. Cathereine, what an amazing book cover! Congrats on your book release! Julie, thanks! Lots of teens are looking forward to lots of movies this year. The Happy Whisk, you might be right. Cats are easier to care for than dogs. Rawknrobyn, thanks!! You should check out The Giver. It’s a classic! Jenny, congrats on the book! Suze, you did better than me on the trivia. I answered none! L. Diane, that’s interesting! Well, the books are always better than the movies. Nutschell, you are welcome! And join us for the Symposium. Brandon and Bryan, they do like the hopeless stories, don't they. Jaybird, I don't think you are crazy. Roland, I didn't like the Hunger Games movie, so that's as far as I go. Andrew, that thought occurred to me as well. Plus cats are low maintenance. Easier for someone to take care of. Out of all the YA movies I think I will like The Giver. Well, that is technically a name but there are lots of bridges! You listed all the Book-to-Screen movies I'm looking forward to do. It's true that SF doesn't appeal to everyone, myself included, but it's worth checking out the genre. I've found a couple of gems over there like Jumper, The Lord of the Rings, and CassaStorm. This past year (maybe two years now) I have been doing a lot of YA reading. It was so much better than I expected that I am now hooked. I would like to see all of these movies and read the books not yet read. I am terrible with trivia. I only knew Highway to Heaven and Cheers. When scrolling through the comments I saw The Minnow and knew that was indeed right. I couldn't tell you how many episodes I've seen of GI. It was galling to forget that bit of information. I don't read a lot of YA but some of those movies sound appealing. And I knew it was The Minnow without peeking at other comments. I can still sing the theme song, too. I hope at least some of those movies live up to their source material. Christine, and I appreciate that! Robin, got two, and I'm sure I've seen ever episode at least five times. LD, I bet you can! I'm looking forward to most those movies, but my goodness, I'd better get reading! Don't want to have my literary vision tainted before reading the books. Looking forward to the symposium. Is that only on Monday? Yikes! Time to get cracking! And need to check out Elizabeth's post too! These books sound inetersting and so do the films. I am sicker than a dog but i hope I can get the answers correct 1. Fox is his nickname. 2.Highway to heaven 3.Maggie shot mr. Burns 4. I used to know but mindfreeze has set in. 5. Cheers! So many great movies! You know, I saw Beautiful Creatures and I really liked it. It was much better than the book (in my opinion). These movies all look like winners. I really liked Hunger Games and look forward to Mockingjay. Divergent sounds very good too. Haven't read the book-- I'm not much of a YA fan, but I like the movies they make. The premise of Veronica Roth's novel is that teenagers living in a post-apocalyptic, walled Chicago must put on a sorting hat — erm, I mean, go into a dream machine — and have visions that help them "choose" one of five groups to join. Like the houses of Hogwarts, each group has a special talent, including selflessness, intelligence, bravery, etc. Because it seems so much of an extension of J.K. Rowling's novels, I may wait to see it on video. But a lot of YA is just a rehash of the old. All that matters is that it makes money and Divergent looks like an enormous cash cow that will be wildly "groundbreaking" to its audience even though the more informed will just say, "We've seen all of this before." Divergent sounds good. The rest...meh. Hubs will want to watch Mockingjay but I didn't like the way they handled the first so I'll give it a pass. I think Catherina's cover is cool. I want to check out Road to Somewhere. Sounds fun. I know two, maybe three, of your trivia, Highway to Heaven, The minnow, and I thought Mulder was his nickname since he didn't use his real one. I remember an episode where they called spooky Mulder but don't know if that was a real nickname. I'm intrigued by The Maze Runner - it's been on my radar for a while but I never paid it much attention. I'll check the movie out though. Maze Runner was among my favorite reads last year. Haven't read more than the Hunger Games, but I'm very interested in finding out how that horrid President Snow fares against the kids. And Frasier is a spin off of Cheers...also favorites! Look at all the new books coming! I really need to learn to read faster. Though while I was sick...I tore through several. There is a plus side to everything! A bunch of great new books out. Congrats to Nutshell! It's great to see her getting out there. By now there's no point in saying I knew any of the answers to those questions as they're right here in the comments section. Now I know what happened to INWG. You were off and it's a week later. I better go check on my girl Elsie. You'd think with me being a huge YA fan and author, I'd be all over the movies, but I'm not really excited for any of them. I'm waiting for the Marvel movies. Those don't disappoint as much as seeing a YA book I love become a bad movie. Birgit, sorry you're sick. And you got three right. Sia, you got three right, in a roundabout way! And I didn't like the first movie at all. Elizabeth, two right, and that's a great attitude. Anne, we did the IWSG last week instead of the first week. Elsie said she had a migraine, which is why she hasn't posted in a while. 2 - Little Cloud in the Heaven?? After finding Hunger Games 2 an absolute overlong slog, the worst two words they could have added to the title of the third movie was "Part 1." Yikes. I hope other enjoy their excess of didactic dystopia. Meanwhile, would you believe I've never even read The Giver? That's on my shame list. I saw the trailer for Divergent in the theater and I was surprised how good it looked (after City of Bones flopped I wasn't sure what to expect). Bezoar? Seriously? That officially beats quincunx as coolest word. I don't know the answer to 1. and 2., but 3. is Maggie (I think I'm the only one who liked that), 4. is the Minnow, and 5. is Cheers. 3/5 isn't bad. I've read all the Hunger Game books and I've seen each movie so far. I eagerly await the next one. Wow! I actually know the answers to some of these!! 1 is Spooky, 2 is Highway to Heaven, 4, is The Minnow, and 5 is Cheers! I didn't know they were making a movie of The Giver. That should be good! It's great to see so many YA books getting made into movies, but I gotta say, I saw the trailer for "Divergent" and I think it was completely botched. The trailer didn't say what was said here - that Beatrice chooses a different faction. It just made it clear she'd done something bad and now no one could know. It was interesting, but the vagueness killed it for me. Oh I'd better hurry up and read Divergent and The Fault in Our Stars! Thanks for the shout out Alex! I'm REALLY looking forward to the Divergent movie! OMGosh, I want to see all of those movies! I love that Tallas cover! I'm your 100th comment! I feel like bells and whistles should be going off. Great movie plans, Nutschell. Funny how many of those are dystopian. Today's generation must have a pessimistic view of the world. I'll have to tune into the symposium, Alex. Whew! Today's been one of "those days" that kept me busy as a beaver. Just now getting back online one more time before bed. Oh...I actually know most of the trivia (except the first), but in light of the nicknames of the guys on Grey's Anatomy, the answer to your first question is McSmolder. 2. Highway to Heaven 3. Maggie 4. USS Minnow 5. Cheers! John, I haven't read it either. And I was bored with the first one. JE, three is good. And you now have a new cool word. Trudessa, if you do, I'd be honored! I'm somewhat of a trivia geek for Gilligan's Island and could probably score 95 out of a 100 such a quiz. The USS Minnow. Divergent is next on my list of books to read. Right now I'm absorbed in Unbroken. What an amazing story! And based on a real person and events. Movie to come out later this year. I know the answer to #5 for the TV Trivia is Cheers! As far as cats being able to make hundred different sounds, I'm wowed. 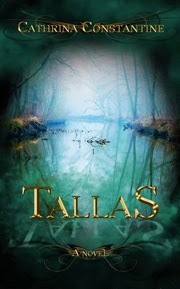 Tallas is a beautiful cover! I am so excited that The Giver is going to be a movie. I have to read the rest of the series now that I recently found out there were more of them! I got the cat sounds right. Yeah! I love Catherina's new cover. Wow. Looks awesome. I liked the book, The Giver. Hadn't heard it was being made into a film. The worldbuilding was great. The end, not so much. I won't be seeing Divergent. I read the first book and held back from reading any more until the series was done. Just not my kind of story. I'm excited for Maze Runner though. I really enjoyed that series. I really enjoyed Divergent, although I probably won't be seeing the movie until it's out in DVD - I just don't seem to go to the movies that often these days. I've just got to read and see The Hunger Games books and movies! I feel so out of it! I spent too much time in third grade I guess. I had no idea that cats could make that many sounds! Have a good one! I still haven't caught Catching Fire but hope to see it this weekend. From the sound of it, Dystopian novels are all the rage! Turns out I didn't know ANY of the answers to the cat questions. My kitty is so disappointed in me. I'm not a big YA fan; getting tired of it actually. But I like Jeff Bridges so I'll probably watch that one sometime. Loved the cat trivia - I prefer cats over dogs. I'm so excited about the YA books being turned to movies. Divergent and Mockingjay top my list. To be honest none of the movies aroused my interest. I'm not a fan of YA books. I'm looking forward to Mockingjay coming out, and hopefully by then I'll have finally read all the books! Stephen, I should test you on that! Helena, give him a treat and he'll forget. Very interesting seven best practices for self-publishing success. 2. Touched by an Angel? Relatively easy. Or I'm a wicked nerd. Alex-- It seems like ever since 'Harry Potter,' the film industry has been obsessed w/ YA fiction. I love these cat trivia questions. I actually did not know any of those. I didn't cheat, so if I got all of those correct, then I really watch too much tv! The one that most interests me is 'The Maze Runner.' I hope it's in the same vein as the Hunger Games films and not Twilight. I need to catch up on The Hunger Games, first read, then watch. The others look very interesting too. Nice job, Nutschell. At least *they're* making some new movies! Not remakes. I've got your book on my to order list! I LOVE Caterina's cover! As for the trivia, I actually know a few. Frasier was a spinoff of Cheers. Oooh the first guest at IWSG! I have to go check it out! I am looking forward to all the movies Nutshell mentioned, especially The Fault in our Stars. wow, i actually knew most of the answers to the tv trivia! really glad to see hollywood reading (or someone is telling them books are great for movies again!) i'm sure these will translate well to the screen, and hopefully make kids want to read more! There are a lot of good YA books that are movie-worthy. I just read Divergent, and am certainly looking forward to the movie! I read the book, The Giver, and would love to see the movie. Surprised that cats beat dogs by a million! That's a lot of cats! I'm looking forward to Mockingjay the most. I'm looking forward to this cool movie list, into darkness and contemporary sci fi is so definitely going forth and prospering, hehe. Sorry I couldn't resist that. Al, an easy nerd? Four out of five. Tara, better than remakes, that's for sure. I have a copy of THE GIVER. Still need to read it. Had no idea they were going to make it into a movie. I'll have to think about the tv trivia questions. I'm sure given time I'll be able to come up with some of the answers. I've actually watched most of the shows at one time or another. Wow, so many great books are becoming movies. I would like to see all of them, but Giver and The Fault In Our Stars are on top of my list. I'm excited for all those YA movies! Still need to read The Maze Runner though. I'm counting down the days for Divergent and especially TFIOS despite the fact that Shailene Woodley is in both of them. Not a fan of hers, sorta find her annoying. But she's got five chances to win me over. As always, thanks for all the news and notes! Trivia - was the Gilligan's Island boat called the Minnow? And Frasier came from Cheers, didn't it? Oh, I love that YA list. Awesome. Thanks! I actually know two of the trivia questions. Record score for me. I didn't know any of the cat trivia. I am looking forward the Symposium. I only see YA movies under pressure from my daughter. I'm not a fan of teenager save the world genre. I'm really looking forward to all those movies! And congratulations to the Ninjas. 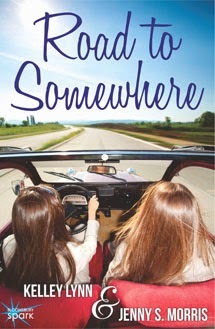 I especially love the fun cover for ROAD TO SOMEWHERE! I didn't know cats could drink salt water! Good method for survival. Why can't we? There's only one of those YA books I haven't heard of, and two I haven't read. Will have to look them up. Thanks to Nutschell for all the movie info! I'm looking forward to them. Congrats to Cathrina on Tallas, and to Kelley & Jenny! I loved that cat trivia! 31 mph is fast! I knew that cats ruled in the pet department. I'll check out the link to Kim's. Happy Friday Captain! 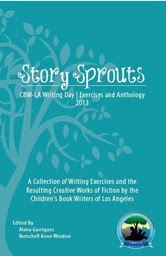 Wow, what a cool post this is~ Yes, I grabbed my copy of Story Sprouts-it is very well done! Hope life is rocking in your world! I loved The Fault in Our Stars and cannot wait to see it!! I've seen the Story Sprouts mentioned two times today, so will definitely check it out. The cover for the book Tallas looks intriguing. I should know the answers to the TV trivia and the only one I can answer at the moment is the name of the boat on Gilligans Island was the USS Minnow (I think) Great post btw! Have a great weekend! So many great books being made into movies - awesome! Shannon, three right. And it would be handy to be able to drink sea water. Yolanda, we'll have to ask him! 1 - oh no, I don't remember. 2- Touched By an Angel? I'm looking forward to seeing all of those YA movies too! I didn't know The Giver was coming out as a movie - not sure if I'm excited or concerned - it's the kind of book (like all my favorites) that lives so strongly in my imagination and I'm not sure the movie will match up. I'm excited for Lois Lowry's sake and the fact that the story will be introduced to a new fan base. Making a note on all the forthcoming movies. I especially want to see The Giver. Loved that story. It must be very nice that Road to Somewhere! Tyrean, got two. And I've never read the book. Beverly, we can blame you for the imbalance then! I'm looking forward to seeing Augustus and Hazel on the big screen. The Fault in Our Stars is such a great book! 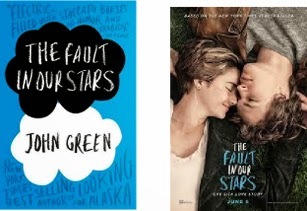 The YA genre is on fire with movie adaptations *and awesome film scores*! I'll be seeing all of these, after I catch up on some reading. Haven't gotten to the Divergent series or Maze Runner yet. Hope to be around the blogosphere more soon, once I finish up the Composer for Relief anthology. Can't wait to see the new YA movies... esp Mockingjay and The Maze Runner... very cool. That Tallas cover does look cool. I'm one of those who just couldn't get into Maze Runner. Perhaps the movie will be better. As far as Divergent... I've already had a lifetime's worth of emotional teen girl dystopians. Time for something new. I'm grabbing the badge for Online Marketing Symposium... And hopefully formulating a worthwhile post as well. Very cool post on Swagger. Good points. Samantha, that's a big project and understand it requires a lot of attention. David, glad you can join us! I loved your Space Opera explanation. I think more and more people are starting to understand your point about the emotions that resonate with a wide audience. For that reason, I'm usually pretty open to a lot of genres, because at the heart of it, a good story is a good story. Fantasy, Adventure, Sci-Fi, etc are all just frameworks. =) Nice post. And there are some great movies coming up. This is the second time I've heard about Maze Runner. Someone told me the concept of my book reminded them of it, and now I can see why based on the description. Well, I may have to read it, because now I'm very curious. I want to see every one of those YA movies. The books I've read so far were excellent. Love that space opera post! I agree - it appeals to readers across many genres. Emilyann, exactly - a good story is a good story. Erica and Christy, you have some movies to catch now! I read The Giver each year with my 8th graders -- hope Hollywood gets this one right. Sorry I am so late getting here this week, and now I will never leave as the theme song from Gilligan's Island is running through my head, over and over, yet it never mentions the name of the boat. Wow all those great movies!! I really need to read The Maze Runner!! I'm looking forward to The Giver and The Fault In Our Stars, especially as the authors have been involved with both films!